China – Is it just threatening for a War ? This is my second article on China. The first article was written in September 2014 http://jupiterastrology.com/c8-mundane/china-recent-intrusions-at-ladakh-is-this-the-effect-of-lunar-and-solar-eclipse/. In this article the analysis were done with respect to the Solar and Lunar eclipses those occurred in the month of October 2014. 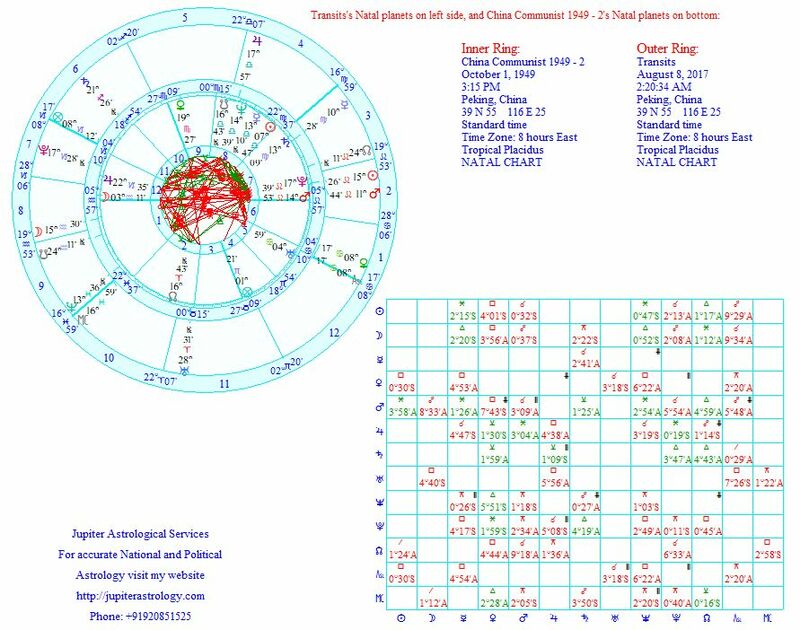 These two eclipses occurred on the 1/7 axis of the China Republic chart of January 1, 1912. The 7th house signifies the “Foreign affairs and its relationship with its allies”. It also signifies war too. After my write-up in September 2014, China witnessed wide spread protest termed as “Hong Kong Umbrella Revolution”. Hong Kong police had to resort to violent measures to control mobs, such as tear gas and attacks on protesters. The protests quietly ended in December 2014. This event was noteworthy as it stressed the delicate balance that has been forged between China and Hong Kong and bodes the potential for change in that delicate relationship in the near future. Until this event, although Hong Kong was technically governed under China, Hong Kong maintained a high level of independence for most issues outside of national defense. Furthermore, Hong Kong maintains separate legislation that differs significantly, and operates separately, from that of the Mainland. This was the time when the intrusions at Ladakh increased and relationship with India began deteriorating. As per the “Book of World Horoscopes” by Nicholas Campion, China has many horoscopes. As you all know China celebrates its National Day on October 1 every year. Every horoscope of China has its own relevance. We will take up the recent stand-off between India and China. We will analyse this with the help of following horoscopes. 1. 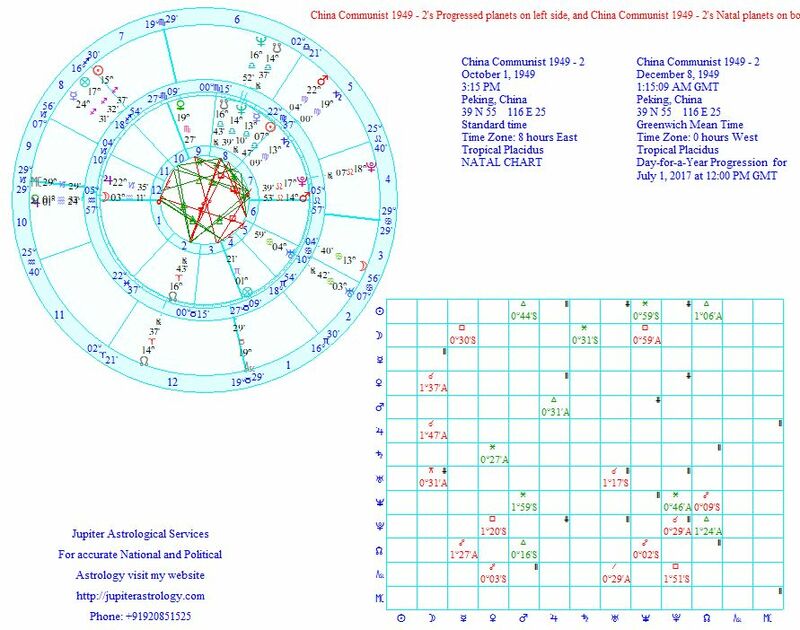 China’s Communist chart of 1949 dated October 1, 1949 at 3.15 pm at Peking, China. The Ascendant rising is 05 Aquarius 57. In Mundane astrology, the 7th house signifies that foreign affairs and relationship with its allies. It signifies war too. In the 7th house of the natal chart two heavy planets namely Pluto (17 Leo 39) and Mars (14 Leo 53). Any affliction to the 7th house or its lord or planets in the 7th house will trigger war like situation and the relationship with allies will suffer. The aspects between the Progressed planets and Natal will give some clue regarding the current happenings. The following are the aspects between Progressed to Natal. In the above chart Progressed Sun is contra-parallel to natal Pluto in the 7th house. Pluto is also lord of the MC (10th house, representing the Government). Here to 7th house is activated. The progressed Moon a monthly basis from July 1, 2017 to next July 2018 does not make any malefic aspects to the 7th house. Now, let us take the transits as of July 1, 2017. This will clearly show the event. This will be specifically when the heavy and slow moving planets make malefic aspects to the 7th house or its lord or planets in the 7th house. The following is the aspects between the transits to the natal. 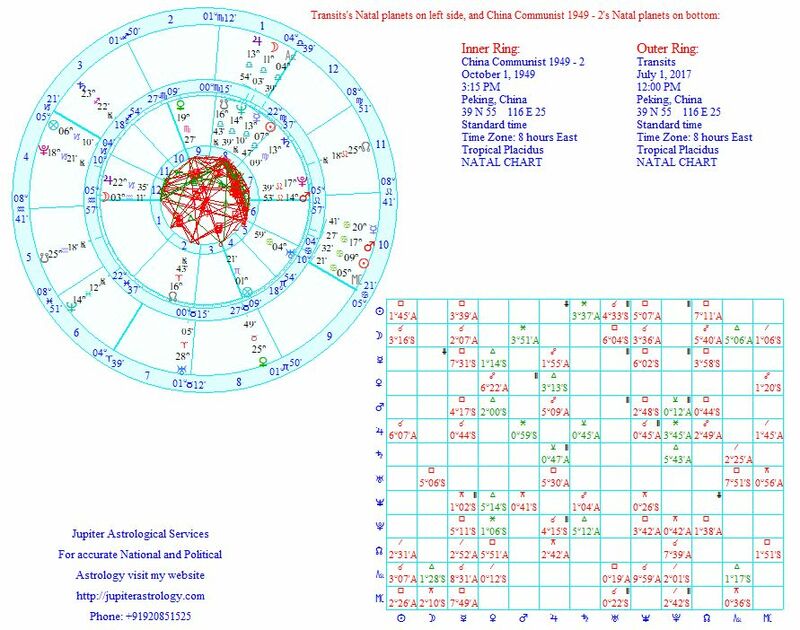 In the above chart, transit Pluto (at 18 Capricorn 20, in natal 12th house) is exact quincunx (150 degrees, malefic) to natal Pluto in the 7th house. 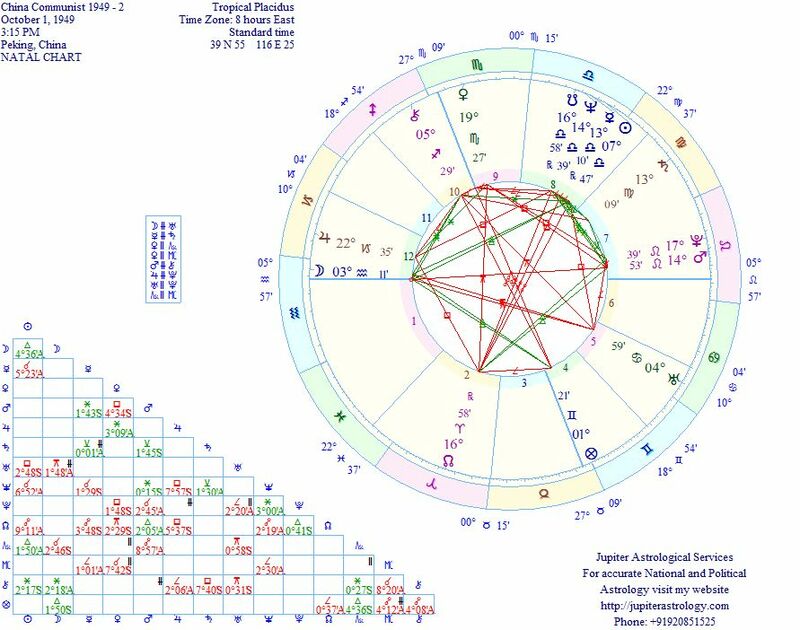 Transit Neptune (at 14 Pisces 12, in 1st house) is in exact quincunx to natal Mars in the 7th house. Both transit Pluto and Neptune are retrograde and hence its effect will be doubly malefic. 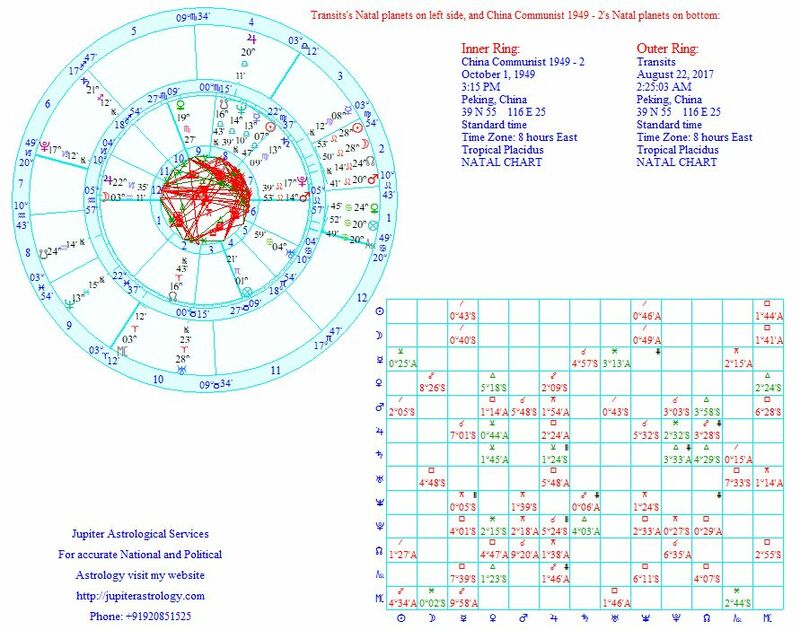 The transit Uranus (at 28 Aries 05, in natal 2nd house) is exact quincunx to natal MC (the 10th house of Government). Here we can see the 7th house is under heavy affliction and portends clear danger of war with its neighbouring countries. Now let us take the August 7, 2017 Lunar eclipse chart. The following is the aspect chart. In the above chart the aspects of Moon (since its Lunar eclipse chart) and North node plays a very important role. At 2.20 am on August 8, 2017 the Lunar eclipse will be at the maximum. Here the Moon is afflicting the natal Pluto in the 7th house by Opposing. Moon is similarly forming opposition to natal Mars too. The North node is conjunct natal Pluto. Now let us see the aspects formed by Solar eclipse chart of August 21, 2017. The aspect chart is given below. In the above chart the Solar eclipse falls on the 7th house of natal chart. This is very serious. This Sun is forming exact square (90 degrees, malefic) aspect to the MC (the 10th house of Government). 1. China’s relationship with its neighbours will turn worse. 2. The G20 summit on 7th/8th July 2017 at Germany will be a stormy one and China will have standoff with India/USA on its various bilateral issues like terrorism, border disputes with its neighbours, etc. 3. Looking at the recent developments at Sikkim border the matter is only going to become worse. Can India take on the mighty China? Yes. Pakistan on one side where it already started and China on the other side. am i to take that WAR with china is now inevitable ? if it happens what will happen in kashmir? will pakistan take advantage of that and thus conflict will occur on both borders ? Means India will have war with China and as well as Pakistan? Or its a trigger to World War III ? Will this be a full blown war, or will it be a escalation and tension at the border, which can be reduced later. What chances India has to face the mighty China in a full fledged war ? The Doklam issue ended. Probably it is due to ending of retrograde motion of Saturn. It will erupt again. Western aspects are very disturbing.